Wow! We made it happen! Austin, Texas Musician of the Year is coming to the village hall! 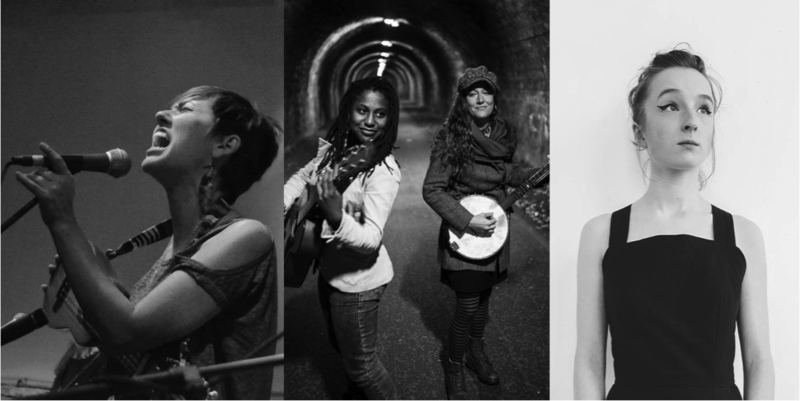 Not only that but we have actually assembled 4 truly extraordinary female artists for an evening of exquisite entertainment – a joyful celebration of women in music and of equal rights. We are BURSTING with excitement! Ever since we saw Gina Chavez on NPR’s Tiny Desk Concert series (now approaching 650000 views!! ), we were determined to bring her to Letham Nights to share her beautiful Latino infused songs and rhythms. And she was determined to come to Scotland. Gina is an award-winning, bilingual, Latin-folk singer/songwriter who expertly blends the sounds of the Americas with tension and grace. She has received national recognition from NPR’s “All Songs Considered” and “Alt.Latino” for her debut SXSW performance as one of the new Latin artists to watch. She won Austin Music Awards for two years running, including three Austin Music Awards for “Best Female Vocals, Best Latin Traditional, and Best Latin Rock”. So we are going to have a massive party. With dancing. Delightful Squalor joins the seasoned talents of singer song-writers Lake Montgomery of Paris, Texas and Cera Impala of Flagstaff, Arizona. These ladies provide honeyed harmonies you can hope to taste delivering an authentic Americana duet project, unique in its charm. Guitar, 5 string Banjo and ukulele in hand, they craft songs that feel timeless, songs to help you forget a world gone mad. A taste of country blues, gospel, folk and old-time jazz, they take from a range of influences resulting in a sound that comes across as quite it’s own. The prodigiously talented young Glasgow singer-songwriter, Zoe Graham completes the quartet. Zoe has an impressive maturity and attention to detail in her music that sets her apart from her peers. On stage, she is masterful with new tech, fleshing out the instrumentation with loop pedals, but she can also tear you apart with a simple acoustic ballad like the soon-to-be iconic Anniesland Lights. The last time Zoe played Letham, she blew us away. Prepare to be amazed. Now surely that’s enough to get you battering down the door for tickets! Brought to Letham Nights by the highly acclaimed Scottish folk singer, Kim Edgar, this Irish folk band are a truly class act. Despite the fact that all of the band, apart from Kim, are German, the band absolutely NAIL the genre. At last we bring back the Bevvy Sisters for another classy night of swing, jazz, folk and blues with harmonies to die for – this time with a unique twist. The Bevvies will run an afternoon workshop to train up a choir of volunteers to perform on the night. Like to sing? Then get signed up!! Sincere thanks to everyone who responded to our call to DO ONE THING ONCE for Letham Nights. We had a most amazing response and now have a database of around 30 volunteers that we can call upon to help us keep the show on the road. We hope that makes you as happy as we are! And if you still want to get involved and haven’t been in touch please use the contact details at the bottom of the page to reach out. 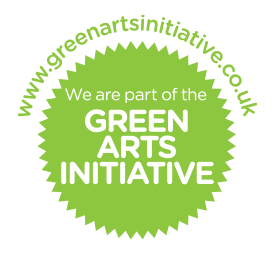 Letham Nights is now a member of the Green Arts Initiative, an interactive community of Scottish arts organisations working to promote sustainability and reduce their environmental impact – a perfect fit for Letham Nights! Run by Creative Carbon Scotland and Festivals Edinburgh since 2013, the Green Arts Initiative supports Scottish arts organisations to be at the forefront of growing an environmentally sustainable Scotland. Letham Nights began in December 2008. Our vision was to bring high quality music to our village hall and provide a stage for local talent. At the same time we wanted to work towards creating a zero carbon village hall. 8 years and over 80 acts later, we have drawn in an audience which now averages nearly 100 in our 120-capacity hall. We have supported hall improvements so that we now have double glazing, better insulation, renewed wiring and a new efficient boiler. The events are renowned for their high quality music and the unique, warm and friendly atmosphere. We really do put on THE BEST SMALL GIGS IN THE WORLD! Like the Letham Nights Facebook Page and join the events. Letham Village Hall, Fife is on the A92 just 15 minutes from the Tay Bridge, 10 minutes from Cupar and 15 from Glenrothes. The Best Small Gigs In The World!